Gold Bond Cornstarch Plus Medicated Baby Powder helps prevent and treat diaper rash, chafing, and minor skin irritations. It is a specially blended formula of cornstarch, kaolin and zinc oxide designed to protect against wetness and chafing. 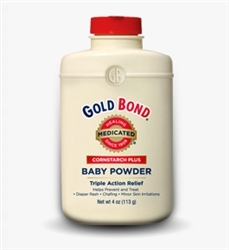 Helps treat and prevent diaper rash. Protects chafed skin and minor skin irritations due to diaper rash. Helps protect from wetness.